After the war, there wasn't a lot of work for fighter pilots, and the Flying Ace was the best fighter pilot in the world. Click here to play! With an incredible record of 18 bajillion missions flown and a kill count equal to twice the populations of the enemy nations, the Flying Ace was a genius without a place in the world once the fighting stopped. That's why like so many other warriors in times gone by, he turned to banditry as soon as the wars dried up. Now you can join the Flying Ace as part of his fleet of Sky Terrors as the bomb cities and villages into submission, and then claim the spoils! If you're more morally inclined, you can subvert his operation instead, become a hero to millions, and rake in fat bank that way. You know, the last one probably has the better long term career prospects, doesn't it? Fly through the mean skies and prepare to battle it out with the greatest fighter pilot in history in the Flying Ace slots. 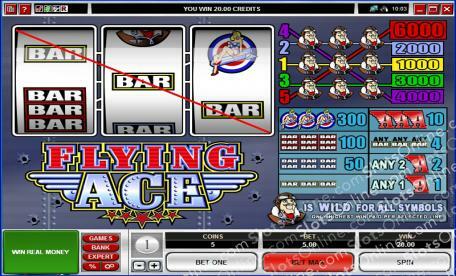 Takeoff is soon, though, so get to the casino before the Flying Ace has the upper hand. The Flying Ace symbol is wild and can substitute for any other symbol in this game.